Sessions are managed by clicking on Tools -> Session Manager. ProSET®s Session Manager allows the recording of when the sessions of the study took place, with the ability to specify the date and time of each session. 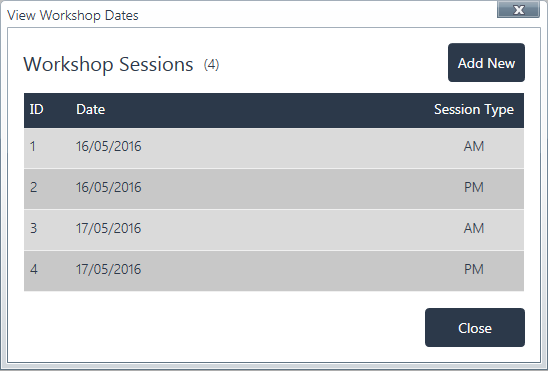 Click on ‘Add New’ to add a new Session or right click on a Session to edit or delete that Session. Note that each Session must be unique, and a Session that duplicates an existing date and time can not be saved. 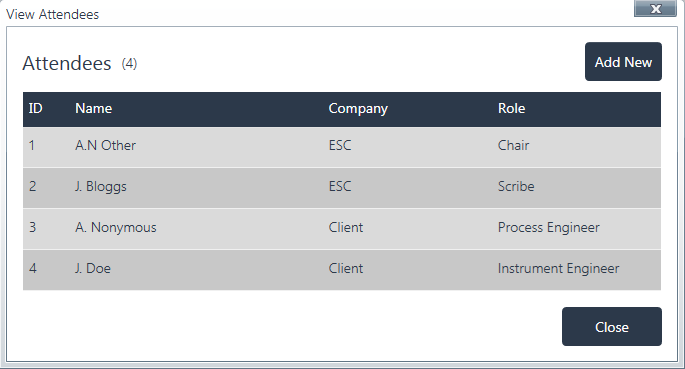 Attendees are managed by clicking on Tools -> Attendees Manager. The Attendees Manager allows the recording of attendees and which sessions of the study they were present. Click on ‘Add New’ to add a new Attendee or right click on a Attendee to edit or delete that Attendee. Assumptions are managed by clicking on Actions -> Assumptions Manager. Record the Assumptions that are made within the study in the Assumptions Manager. Click on ‘Add New’ to add a new Assumption or right click on a Assumption to edit or delete that Assumption. Drawing Numbers are managed by clicking on Tools -> Drawing Numbers Manager. The Drawings used within the study can be recorded using the Drawing Numbers Manager. The Drawing Numbers are available for selection when configuring Hazards and/or Nodes. Click on ‘Add New’ to add a new Drawing Number or right click on a Drawing Number to edit or delete that Drawing Number. Note: a Drawing Number cannot be deleted if it has been assigned to a Hazard or a Node. A warning is displayed when attempting to delete an assigned Drawing Number detailing the Hazards and/or Nodes in which it is used.